2 in 1 Software Vr. 3.9 Total 41. 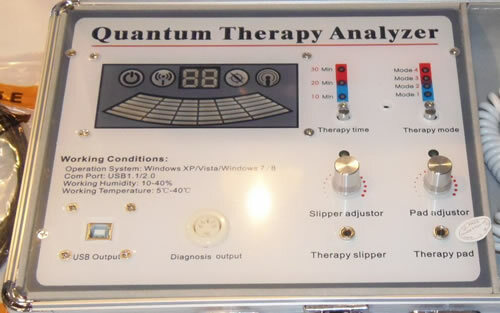 This Quantum health analyzer integrates medicine, bioinformatics, electrical engineering and other sciences. 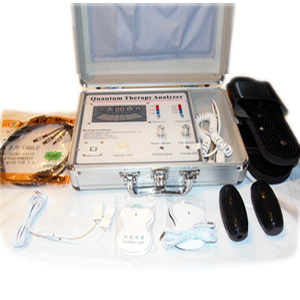 Theoretically based on quantum medicine, this health device utilizes the advanced electronic equipment to collect the weak magnetic field of human cells for scientific analysis. Then on the basis of this analysis, the tester can get the health status of the tested person and make a diagnosis. Quantum health check system is a kind of health examination instrument that can make noninvasive checkups of the human body. Simply by holding sensors in your palm, the health data will be collected within minutes from various body systems. The analyzer can capture the pathological changes of cells and predict the precursor of disease. By taking health-care actions at this moment, you may be enabled to effectively prevent the various chronic diseases. With the Body Health Analyzer one is able to get a detailed look into the condition of the entire body. Prediction without symptoms: With only 10 or so cells of pathological change, the analyzer can capture the pathological changes of cells and predict the precursor of disease. By taking health-care actions at this moment, you will be enabled to effectively prevent the various chronic diseases. Speed and accuracy: Multiple indicators of your health can be obtained within minutes. This analysis method is designed to save your time, money and energy. The database of the analysis system has been established with scientific methods including Fourier’s principles, strict health statistic treatment and demonstration of a large number of clinical cases, leading to high accuracy. Non-invasive and painless: The analysis will tell you the condition of your health without ultrasonic, nuclear magnetic resonance, radiography or any invasive testing. Simple and convenient: It is simple in its operation and in general, people will be able to analyze and interpret the result through short-term training. Health checks can be performed in any place and at any time, saving the time of patients. The cost for analysis is reasonable and affordable and can be accepted by most consumers. Remove all metallic objects, hand phone, pocket PC etc. Ladies should not take up the test during her menstrual period. Patients who have pacemakers are prohibited from doing this test as the frequency emitted from the Quantum may interfere with the pacemaker or any other electronic device within the body. Disclaimer: This product is not intended to diagnose, treat, cure, or prevent any disease. If on any medication or pregnant please consult with your doctor before taking this test.